The Ultimate Gift Guide for DIY Addicts! Here are some awesome gift ideas for the DIY addict in your life! 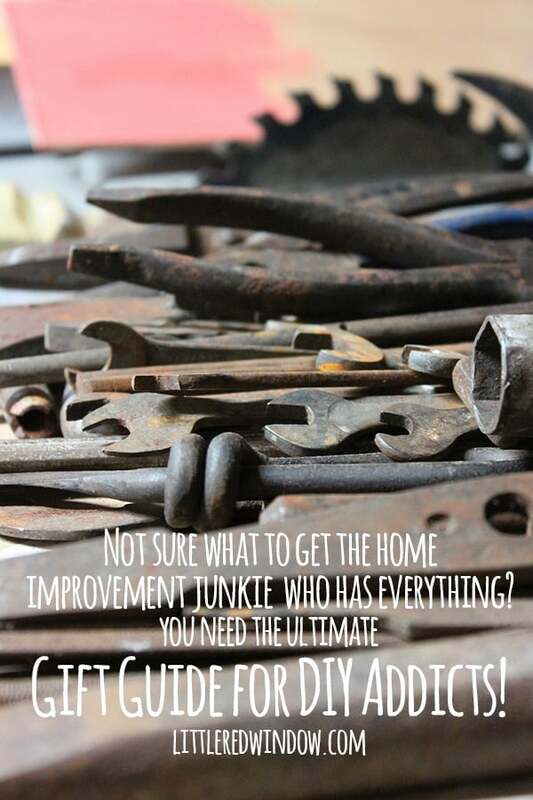 We all have at least one DIY addict in our life, don’t we? For me it was my aunt and she had pretty much every tool under the sun which I just thought was so cool. For my friend, it was her dad who had an entire woodworking workshop in their basement. Whoever the DIY enthusiast on your shopping list, I’ve got gift ideas for you! Because, trust me, I know we can be hard to shop for! My ratcheting screwdriver set is my #1 most prized DIY possession. I honestly don’t know how I ever lived without one! Seriously, save your loved one some major hand and wrist fatigue, they’ll love it! I should put this fun tool belt on the top of my list. I’m constantly stuffing my tape measure in my jeans pocket and then having trouble finding it! I just bought this 12V cordless drill myself and I’m totally in love. It’s nice and lightweight, has an LED light to light up your work and did I mention that it’s cordless?! We put a Nest Thermostat on our Christmas list a couple of years ago and it’s great! It’s easy enough that even a novice DIY-er can install it themselves and their customer service is amazing! Save your DIY addict a trip to the paint store and get them this awesome color matcher! Now they won’t have to drag that heavy cabinet door with them! I know sometimes our DIY addict loved ones think they are a little more handy than they are (ahem) but this awesome garage door opener that you can control with your smartphone is so easy to install even a newbie can do it! You can even control it when you’re away from home! The coolest safety glasses EVER. How cool! A magnetic wristband to hold screws, nails and other hardware!